Indian Super League club Kerala Blasters are all set to sign Baoringdao Bodo from I-League club Gokulam Kerala FC. The Indian U-19 player will join the local ISL side on loan for the remainder of the season. In other news, Augustin Fernandes could be signed by Jamshedpur FC for the remaining season. Blasters have already shown their interest in banking on youngsters. 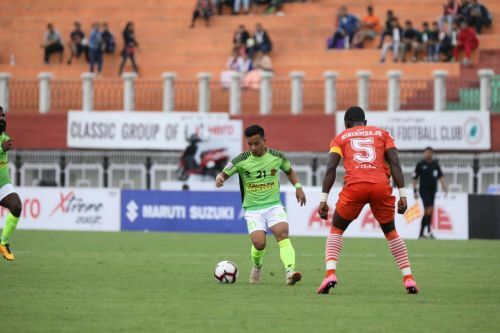 They have roped in Jeakson Singh, India’s first and only goal-scorer in a FIFA tournament so far, on loan from Indian Arrows before the start of the season. They also signed goalkeeper Dheeraj Singh. Bodo’s inclusion would only bolster their young squad. Bodo caught the attention of the football fraternity after becoming the youngest ever goal-scorer in the I-League. Bodo was 17 years, 3 months and 18 days old when he scored against Mumbai FC. After that, he became the youngest player to take part in an ISL match, when he took the field FC Goa in 2017. The Assamese started his career with SAI Guwahati before joining AIFF Elite Academy. He was signed by Chennaiyin in 2016 and loaned to Minerva Punjab for the next I-League season. After playing two matches for Chennaiyin, he was loaned to Gokulam Kerala. There too he scored a goal against Neroca FC. It was probably this performance of his that caught the eye of Blasters’ management, who have only pride to save in the remainder of the season. Players like Sandesh Jhingan, CK Vineeth have already expressed their wish to leave the club. Blasters are trying to fill the void by installing young blood in the club. Fernandes, who was released by ATK in the January transfer window last year, has failed to find a taker so far. But he was seen giving trails to Jamshedpur FC in November under the supervision of coach Cesar Ferrando. There was a rumour he could be signed as a replacement of suspended Gourav Mukhi, but nothing fruitful happened thereafter. It seems that Jamshedpur management has finally decided to sign the defender this year but nothing official has been made so far. Jamshedpur have looked shaky as far as defensive issues are concerned. Fernandes would be a great addition for them. The Goan defender has spent his time with ATK and FC Pune City in ISL earlier.